What to take and take care of for a true family vacation. You’re going on vacation! But, mixed with your excitement is a tinge of packing stress. Here’s how to get to any destination without losing your mind. First, make sure you have the right luggage. Airline regulations have become much more stringent about the size, weight and amount of luggage permitted. Regardless of the specific restrictions, when packing for a vacation, think light. Consider investing in lightweight canvas suitcases on wheels that will stand the test of time. Personally, I like the duffle bags on wheels that have a separate zip compartment on the bottom for shoes. 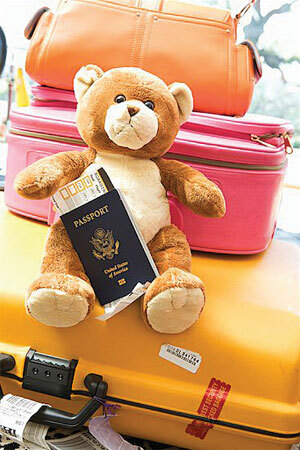 All family members, even babies, need passports for travel outside of the United States. Confirm your family members’ passports are all up to date. Make copies of your passports and other important documents, such as visas and airline itineraries, and keep them separate from the originals. When I travel, I make three copies of my family members’ passports. I carry one set of copies with me, pack one set in my luggage where it stays and store the originals in the safe of our hotel room as soon as we arrive. Understand how all of your electronics work before you leave home. Do you have the appropriate chargers and batteries for your laptop, cell phone and camera? Do you need to make changes to your cell phone plan, such as to allow international calls? This should all be done well before your departure. Depending on how long you’ll be gone, you may want to ship clothing, toiletries and supplies in advance of the trip. Consider using a Web site like www.drugstore.com to ship heavy items, including packages of diapers, wipes, sunblock and baby wash. Place the order at least a week in advance and then confirm that the hotel has received your shipment before you leave home. Be prepared to do without some of the conveniences that you use at home. You can live without a baby bath and a second stroller for a few days or even a few weeks. Also plan your itinerary in advance. Make dinner reservations, spa appointments, tee times and other bookings well before your departure date. Check with people at the facilities you want to enjoy, such as at the hotel spa or excursion desk, when finalizing your travel plans to confirm all bookings. You should be able to change your plans when you arrive, but don’t risk being told that the only time you can eat at the popular restaurant in town is at 11pm. Once you’ve taken care of all of the pre-packing necessities, you can begin your actual packing. Whether you’re packing for a sunny beach or a ski vacation, try to stick with one color scheme for each member of the family. Metallic and denim clothing are both excellent choices because they match everything. If children want to be involved in the packing process, encourage them in age-appropriate ways. Give specific instructions to toddlers, perhaps to pick out three pairs of pajamas or ten pairs of socks. As children get older, you can tell them to select five outfits. Once you have a preteen or teenager, the difficulty becomes scaling kids back from packing an entire wardrobe. Consider using the rule of thumb that kids can take whatever fits in a specific piece of luggage, which they have to carry themselves. After deciding what you’re taking, make neat piles in a designated area. Put small items such as socks in Ziploc bags. Pack in layers with heavier items like shoes and things you won’t need immediately on the bottom of the luggage. Place the things you should need first on the top. Pack a portion of each family member’s clothing in each suitcase. For example, if you have a family of four, put a quarter of everyone’s clothing in each suitcase. That way, if luggage is lost, everyone will have enough clothes to get by until the missing bag is located. The only caveat is that it might hinder your teen’s packing regimen to lose some coveted room in one’s personal suitcase. Just cross your fingers that your teen’s luggage does not get misplaced! Of course, luggage occasionally gets lost in transit, and accidents and emergencies can arise. Carry medication, cameras, laptops, important documents and any expensive jewelry with you. Also carry on planes a complete change of clothes for each family member as well as what you’ll need when you first arrive at your destination. If you’re going on a beach vacation, pack bathing suits and sunblock in your carry-on luggage. Say you arrive at the hotel and your room isn’t ready, you can go to the pool without digging through your luggage in the middle of the hotel lobby. Also carry whatever electronic games, books, crayons and music your family relies on for entertainment during flights and long drives. One last tip: When you leave the hotel for an excursion or that desired dinner reservation, put a piece of hotel stationery in every child’s pocket. If a child gets lost and forgets the name and address of the hotel, you’re covered. Happy travels! Barbara Reich formed Resourceful Consultants, LLC, in 1999. She holds bachelor’s degree in psychology from the University of Pennsylvania and an MBA in management from New York University. Reich spent the first decade of her career as a management consultant, and applies the same skills that made her a successful consultant to help her clients establish systems that eliminate clutter, streamline overbooked days and improve overall quality of life. Learn more at www.resourcefulconsultants.com.